A searing debut novel centering around a gay conversion camp in Mississippi, and a man's reckoning with the trauma he faced there as a teen. Camp Levi—nestled in the Mississippi countryside—is designed to "cure" young teenage boys of their budding homosexuality. Will Dillard, a Midwestern graduate student, spent a summer at the camp as a teenager, and has since tried to erase that experience from his mind. But when a fellow student alerts him that a slasher movie based on the camp is being released, he is forced to confront his troubled history and possible culpability in the death of a fellow camper. As past and present are woven together, Will recounts his "rehabilitation," eventually returning to the abandoned campgrounds to solve the mysteries of that pivotal summer, and to reclaim his story from those who have stolen it. 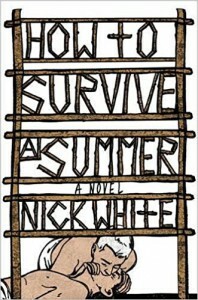 With a masterful confluence of sensibility and place, How to Survive a Summer introduces an exciting new literary voice. I wanted to love this book so much more than I did, but it was unfortunately juvenilely written and hard to slough through. One character aptly assumes at one point that our narrator doesn't want to talk about his story because he may feel it's just another example of a gay boy growing up and getting out of a small town, moving from a rural area to a metropolitan area and not terribly worthy of sharing. This was the most poignant moment of the novel, because I think a lot of people do feel this way when they should know that their perspective is also important. I don't know. I was so psyched for this book but it didn't captivate me or compel me. It wasn't as gruesome as promised, not that I wanted to see gruesome specifically, but I expected there to be more shock factor for how the book was sold. There was one character who was very fucked up and I think that this was much more the problem in the story than the idea of "stomping out the gay." I feel like there could have been more. Will's current life is very strange and aimless and could have better been written into its own story. His relationships with a guy he's interested in and a friend who's more a mentor were both very strange and were described as more intimate than they really are. I kept getting bored and wanting to give up. Ultimately, the ending was super unsatisfying also, and I was left in limbo wondering what I had just read. While I think this topic matter is important, I would have liked to see this story differently done in a manner that would be much more captivating. I felt like the title was false advertisement, honestly. This was disappointing. If you're interested in the topic manner it might be worth your time, but it was far from the slamdunk I was hoping this would pull on my emotions.